football | Masters of What? 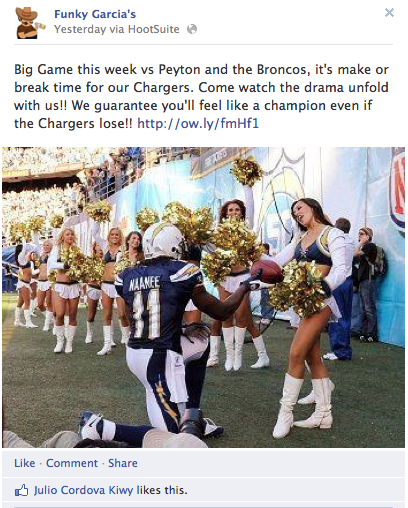 As if losing to the Broncos on the field wasn’t bad enough this past Sunday, Facebook has been particularly insensitive to Chargers fans this week. Fans of a particular sports team may seem like a great audience for brands to tap into (being known to be intensely brand-loyal), but like any group, it is vitally important to know what is important to them and be aware of what is going on in that subculture. 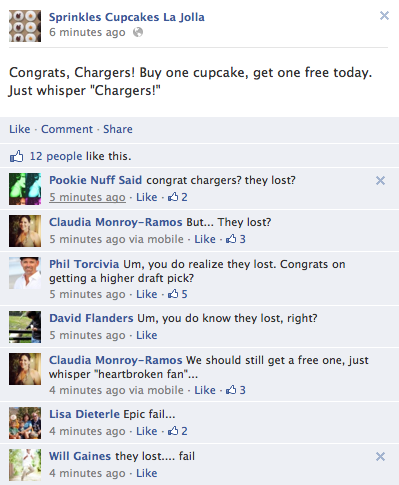 A few brands failed miserably at this in the past week while trying to market to Chargers fans. Now I was lucky enough to catch this “epic fail” before they deleted it. Yes, they simply deleted the post along with these scathing comments. And no, they didn’t do anything to right their wrong. 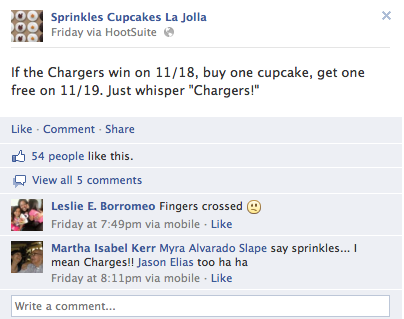 A simple Google search would have told whomever runs their Facebook that the Chargers lost and that this post would upset fans, but even after the mistake, they had the opportunity to give away consolation cupcakes or SOMETHING (even one of the upset commenters had an idea of a new “password”)! But no, they just pretended that you can erase things from the Internet. Wrong. The next example illustrates once again how stupid it is to schedule posts. The people over at Funky Garcia’s got lucky because apparently their fans have had enough margaritas to ignore the fact that this post popped up a day AFTER the big game. “Even if the Chargers lose” huh? Yea, we’d have no idea how that’d feel. 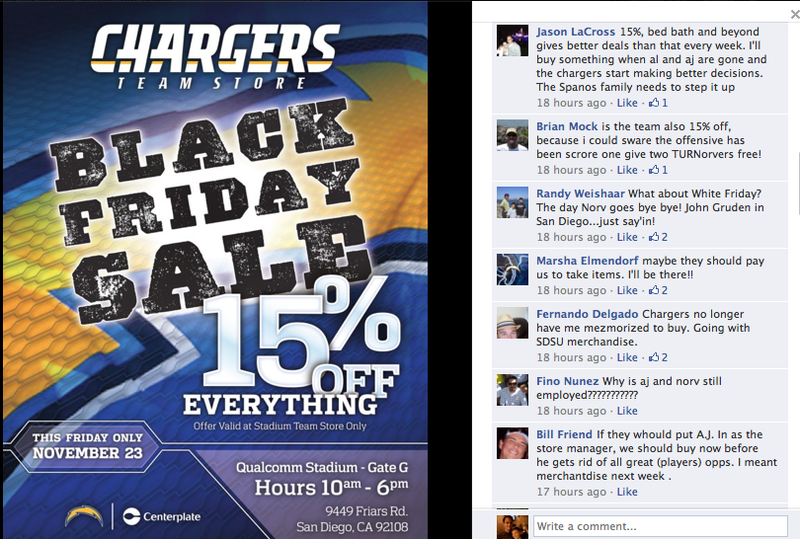 The final OOPSIE of the week goes straight to the Chargers fan page and their team store who is having a 15% off Black Friday sale. Now, if these people were remotely in-tune with their frustrated fans, it would be clear that this could have some negative backlash. It did. Enough so that UT San Diego covered it. For sports fans, the successes and failures of their teams are a very real and important part of their lives. So, social media types, don’t be stupid. Know who you are talking to, and please, know what you are talking about.